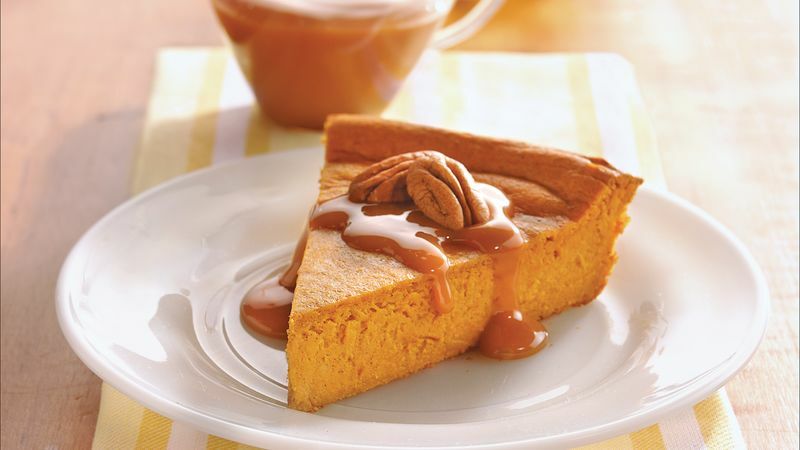 In blender, place all ingredients except caramel topping and pecan halves. Cover; blend on high speed about 2 minutes or until smooth. (Or beat in medium bowl with hand beater 2 minutes.) Pour into pie plate. Bake about 45 minutes or just until puffed and center is dry (do not overbake). Cool completely, about 1 hour. Refrigerate at least 3 hours until chilled. Drizzle servings with caramel topping; garnish with pecan halves. Store covered in refrigerator. Top cheesecake with whipped topping, pecans and a drizzle of caramel sauce.